If there is one thing which has allowed humans to evolve to a point where we’ve reached today, it is the sharing of information. There is no place better than a school as far as imparting knowledge is concerned. The hospitality industry has grown at an exponential rate in the last few decades which has increased the needs for talented and highly-educated management professionals. In this post, we discuss the top hospitality management schools in the world. Fortunately, for us, there are some respected institutes which take talented people and mould them into educated managers for the hospitality business. These are 11 respected names offering hospitality management courses from all over the world and are equipped with awesome campuses, faculty members and alumni with excellent networks. We have listed top hospitality management schools and the rankings are not in any order. All of these institutions are great colleges and there are other great institutes which we aim to include in future updates to this post. Please also check our other post on Best Hospitality Schools in the world in 2018. What makes our listing convincing is that once again most of these top hotel management institutes rank high on the reputed QS World University Rankings 2019 for Hospitality and Leisure Management institutions. We don’t intend to make any claims with this post. The intent of the post is to provide a useful list of institutions to initiate proper research. Popularly shortened EHL, Ecole Hôtelière de Lausanne isn’t your average hotel management school; it has a longstanding history partnering with the Swiss and mainstream hospitality industry. That means students get to work with world-class hospitality facilities. This is one particular reason that makes EHL special and one of the best hotel management schools in Switzerland and the world. EHL is one of the world’s oldest and finest institutes when it comes to hospitality management. The program taught at EHL is based on the needs of the industry as the Institute boasts a long history of working with the Swiss and international hospitality-related businesses. These close ties ensure that students get ample experience opportunities during the course of their studies in the form of internships and are employed soon after their graduation. 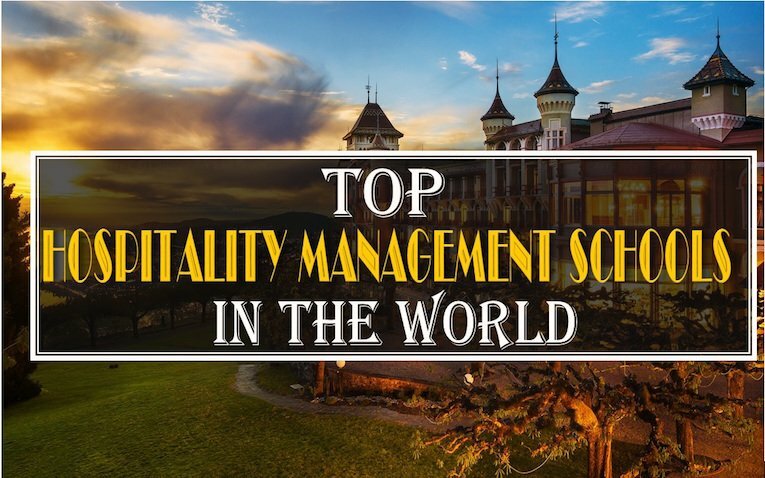 There are reasons for placing this prestigious hospitality management school in our list of best hospitality management schools in the world. Let’s explore more here in numbers. EHL has students from over 100 nationalities. This ensures a great mix. What is even more pleasing is that they have great gender mix with almost 60% of the students being female. EHL is accredited by both NEASC and AAQ which ensures that it meets stringent international standards for higher education. There is a lot more about this hotel school that makes it special. It has been named as the world’s best hotel management school multiple times by almost all reputed rankings. EHL was also named as the best hospitality school in the world in the 2013 and 2014 worldwide hospitality awards. So, What makes EHL stands out from a sea of other top hospitality management schools in Switzerland and the world? For one, a whopping 35% of all EHL alumni are current owners or CEOs of prominent hospitality businesses. It’s also NEASC and AAQ accredited and attracts students from over 100 countries. To know more about EHL and how they are doing, visit their page EHL in numbers. SHA is a major college of one of the most respected universities in the world, Cornell University. It is highly respected in the industry as it was established was at the request of the American Hotel Association to provide competent people skilled in the hospitality sector. SHA Cornell is the only standalone Institute to have the hospitality programme with AACSB accreditation. For those who are not aware of AACSB accreditation, it is one of the most prestigious and recognised accreditations for business schools and MBAs in the world. Also, SHA has over 51 Cornell Hotel society active in 6 continents to boost employment opportunities and reputation of the college. With an unparalleled name and one of the biggest employer pool, a lot believe it to be one of the top hospitality management schools in the world. There has always been a rivalry between SHA, Glion and EHL for the coveted top spot. While a lot may argue about this, it is important to keep in mind that these along with a lot of others are great institutions. These are the best Hotel management institutes in the world in some way or the other. This article aims to give you ample information to weigh all the facts to make your own best decisions. Offering best-in-class hotel management courses isn’t just another tagline to Glion Institute of Higher Education; it’s what the school stands for and has always strived to achieve. And, they have brought their A-game over the years. Arguably one of the best hospitality management school in the world has done justice to its reputation over the years. We have placed it on a joint 2nd position. Based in Montreux overlooking serene mountains and lake, this Hospitality Management School has excelled in imparting the superior quality of hospitality education and training over the years. It has been awarded as the best hospitality management school for 2015 at the Worldwide Hospitality Awards in Paris on November 5, 2015. Glion now also offers an MBA from London and has also started Luxury Brand Management Specialization in 2016.
International diversity– 93 per cent of students are international with students from over a hundred nationalities. Employability– 100% of the job-seeking graduating candidates had multiple job offers in 2015. Around 14% decided to pursue the course further or took the entrepreneurial route. Internships- Currently enrolled candidates have internship opportunities in over 60 countries and every student has close to 5 internship offers on an average. Campuses– Has two campuses in Switzerland and one campus in London. It also provides online courses. Alumni record- As per records from the institute over half of the graduates become General Managers, Executive Directors or Entrepreneurs within 5 years of graduation from the institute. The alumni strength in 150+ countries is over 13,000. Look for further details section of Glion International Hospitality Management School to seek more information or visit the Official website for more information about the institute. GIHE certainly has the most ambient and conducive atmosphere for students to learn hotel management ropes. It’s always fascinating how a small country like Switzerland can boast some of the best landmarks, attractions, and cultures. Its hotel industry has certainly done a bang-up job too. Swiss hospitality management schools have made remarkable leaps and milestone over the past half-century or so. They offer unbeatable hands-on hospitality management courses, food and beverage evaluation labs, and so forth. One of the top hospitality management schools in the world is Les Roches which now has multiple campuses. Les Roches offers a number of programs for the staff required at management positions in the hospitality industry. These programs include a three-year diploma, Bachelors and Masters Programs. There are four campuses of Les Roches spread in different parts of the world and all work with their local hospitality businesses. The last century saw a boom in travel as the aeroplane became a convenient mode of transportation. SHMS was one of the schools which were established to provide managers for the booming tourism and in the few decades of its existence, it has made quite a name for itself. Not only have they excelled in terms of quality education but also have one of the best campuses in the world. This hotel school is not as old as few of its counterparts but is growing at a rapid pace in terms of employer repute and alumni strength. With its excellent campuses in Montreux and Leysin, it is growing into a reputation as one of the top Hospitality Management Schools in the world. SHMS (as famously shortened) is one of the best hotel management schools in Switzerland which has seen a rapid growth in the past 2 decades. With two campuses, SHMS takes advantage of the booming Swiss tourism industry to offer high-quality management education that features a hands-on approach. It also lures students from all walks of life across the globe. Recently, it has gained increased traction with mainstream hospitality-related businesses, marking a new era in its longstanding history of offering world-class hospitality-related management courses. As it says, at the heart of Hospitality, this Hotel School has a stellar reputation in terms of its Hospitality Management courses. Hotelschool was founded to serve the needs of the hotel and catering industry in the Netherlands. It took a very short time to establish itself as one of the leading schools in the hospitality business. The graduates of Hotelschool have served in different managerial capacities all over the world. The School of Hospitality Management is a part of the highly renowned Michigan State University which was established in 1927 to provide leaders for the local hospitality industry. It is regarded as one of the original hospitality management schools and some of the brightest students choose this for their entry into the world of hospitality management. Even though Hotel School Vatel is comparatively younger than some of the other schools on the list but it has established 31 branches all over the world. This Hospitality school graduates nearly 7000 students every year serving in different managerial capacities all over the world. Its study method involves putting students in the role of managers and competitions are held. Oxford School of Hospitality Management is the leading hospitality management school in the UK. It is part of the Oxford Brookes University (OBU). Students are given ample opportunities for experience in the industry which helps them in their future roles as managers. The University has hundreds of courses. Hotel management courses at Oxford Brookes are highly rated and thus it finds a position in our list of Top 10 Hospitality Management schools of the world. Yes, Switzerland again. It is one of the most popular destinations of tourists and thus the best place to understand hospitality and tourism. You will find that it is the homeland of a few of the finest and top hospitality management schools of the world. César Ritz Colleges have been providing quality education in the field of hospitality management for over 35 years now and for all these years, a large number has graduated and applied the skills they learned here in real-world situations. Take beautiful sea-facing facilities, top-notch tutors, and add robust coursework – and that is the magical allure of César Ritz Colleges. We finish our list of top hospitality management schools in the world with another excellent hospitality management school in Switzerland. This hospitality school that was established in 1914 has won many accolades for its unwavering contribution to the world of hotel management. 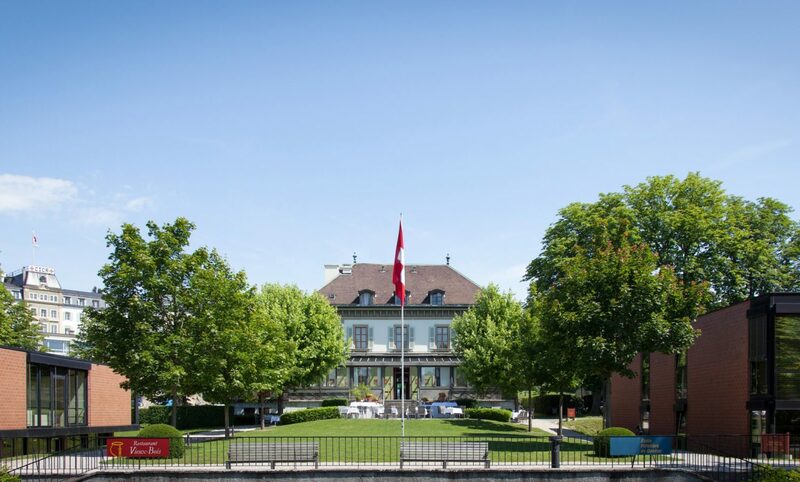 The school adopted its English name Hotel School of Geneva back in 1996 and ever since has ridden on a roller coaster that is increased student intake, bolstered partnership with the hospitality businesses, and recognition by accreditation institutions all over the world. Ever since its establishment, it has produced competent professionals who have brought great respect for their institution. Hope you liked our collection of top hospitality management schools in the world. We would like to reiterate that Please do extensive research before enrolling yourself in one of the hotel management schools. This post ensures that readers get a good platform for further explorations. We haven’t ranked these hospitality schools in any particular order. We will keep adding more hospitality schools and resources in future updates. So, please stay around.